Here at foldablebags.com, we aim to promote eco-friendly alternatives to plastic bags. We are aware that using plastic bags is like a bad habit that’s hard to remove. We cannot blame you because our society continues to use it. It is convenient to use , cheap and readily accessible. Most retail stores are offering it free for every purchase. However, the trend is slowly changing. Some chain stores such as Target, Carrefour, Fred Meyer, JC Penney, IKEA, Tesco and Macy’s are actively promoting the use of alternative eco-friendly bags. Personally, I think it’s a brave move for these chain stores to pursue this initiative of using eco-friendly bags. However, I applaud them for taking leadership in doing the right thing. In the near future, I hope that other stores will follow. In fact, once you get used to the idea of not using any plastic bags you will realize that there is really no need for one. A reusable bag is a more practical and eco-friendly alternative for all your shopping needs! There are so many designs available! To add, most can be conveniently folded into the size of your wallet or even into a tiny key chain. You can always carry one in your bag or your pocket! Just like these retail giants, I hope you can take a stand against plastic bags and set the trend in using eco-friendly alternatives. Checkout our eco store to view a range of foldable reusable bags and start using one now! New York Magazine posted this video by Jonah Green in YouTube back in 2008. However, it seems a lot of people haven’t viewed it yet, so we wanted to share it with you. Joshua Allen Harris used plastic bags, trash bags and shopping bags to create street art. He explained that part of its magic is “it looks like trash on the street then it becomes animated and comes to life“. 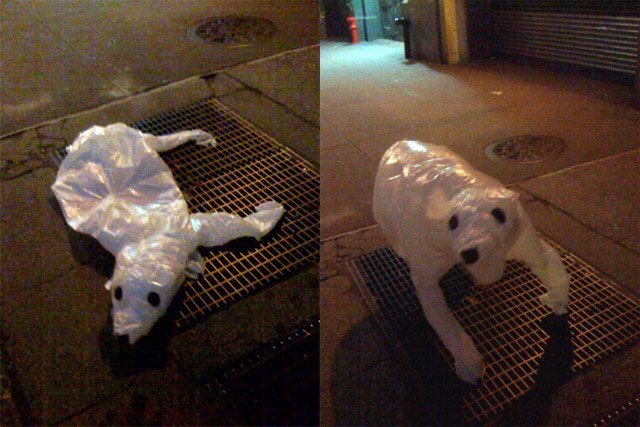 He cleverly used exhaust and subway air to bring these plastic bag sculptures to life. We wish that more people can be creative in recycling plastic bags instead of simply (and sometimes carelessly) disposing it. Most plastic bags end up in our waterways and landfills. It can harm our wildlife and eventually humans, as it pollutes our soil and water. “Going Green” is not a trend. It is becoming more and more of a fashion icon. Green apparel or more popularly referred to as “eco fashion” refers to clothing designed using ethical, sustainable and environment-friendly products. Four years since 2006, eco fashion is still considered hot! In fact, the Museum at FIT in New York will be holding an exhibit about “Eco Fashion: Going Green” from May 25, 2010 through November 26, 2010. It will feature the works of popular eco fashion labels Edun, Bodkin, FIN, and NOIR together with more than 100 garments, accessories, and textiles from the mid-18th century to the present. The exhibit will provide a historical context of how eco fashion movement evolved in the fashion industry. Here at foldablebags.com, as avid shoppers we wanted to do our part for the environment by promoting reusable shopping bags. We aim to encourage people to use”eco bags everyday and every time” and not only when they remember to bring them. Foldable eco bags make it more convenient for any shopper to always have it handy inside her everyday bag. Please visit our Foldable Bags Store, Eco Bags Store and The Eco Store pages for a selection of foldable eco bags and other eco-friendly products.